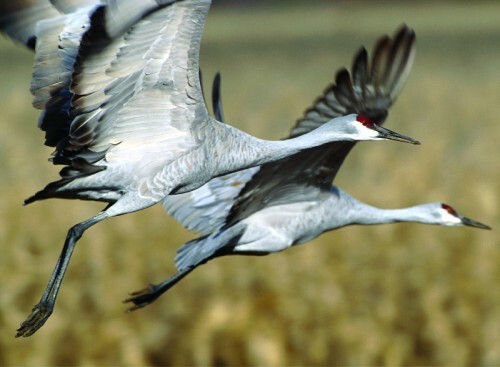 Join Hawks Aloft at the Festival of the Cranes /Hawks Aloft Inc.
Join Erik Andersen from Hawks Aloft to scout out some of the many species of raptors that winter in the Rio Grande Valley. We’ll visit public areas of Bosque del Apache and possibly travel some of the back roads of Socorro County in search of rarities such as Harlan’s Red-tailed Hawk and more. Limit 22. Meet at the Visitor Center bus stop. Have you always wondered about the mysterious world of raptor identification and just what that large hawk flying overhead might be? Join Erik Andersen for an enlightening look into the world of raptors and how to distinguish them from one another. Plumage characteristics, season, behavior and habitat all provide clues to their identity. Thanks to the wildlife photographers that donate their work to Hawks Aloft, this program promises to be a visual art show. Limit 50. Have you ever seen a yellow-billed cuckoo? Or heard the hauntingly beautiful song of the hermit thrush? Did you know that it is possible to identify some birds by the sound of their feet scratching in the leaves? Some of the habitats of the riparian woodland along the river support incredibly high densities of birdlife, from common species to seldom seen or heard rarities. Other areas support tragically low numbers. Hawks Aloft’s Trevor Fetz will show some amazing photos and share fascinating information about the many birds found here and how they adapt to an ever-changing environment. Limit 50. The sandhill crane and the golden eagle in a life and death encounter; fledgling Cooper’s hawks and American crows forming a juvenile pack; Swainson’s hawks feasting on bats; burrowing owls and Ferruginous hawks sharing the same prairie dog towns: both predators but one also prey. Erik Andersen and volunteers from Hawks Aloft will share real life stories and fascinating life histories of some of the raptors that call New Mexico home. They’ll bring several of their live educational raptors so you can get up close views and photographs, too.